Be in Love and be open to the Power of Divine Love which is present on Earth in many forms. 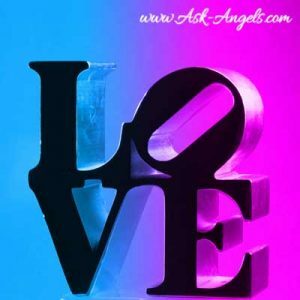 This new free angel message with Archangel Zadkiel will connect you directly with Divine Love. Through celebrating love with awareness and gratitude, love will multiply, bringing blessings of love to you and to all. Simply Relax and Listen to this new free angel message which will assist you in tuning into the Divine Love broadcast from the Angelic Realm and Archangel Zadkiel ! Or keep reading to experience this angel message with Archangel Zadkiel transcribed. Beloved one indeed, I Archangel Zadkiel, am here. You are greeted now with love and know that indeed, love is present in physical form. Know that, indeed, love connects all of creation in the form of one unified energy. Know that love holds the power to transform your entire life. Know that love holds the power to heal, to inspire, and to uplift. Know that love is not separate from you, rather, love is everywhere and by attuning your vibration to love, by attuning yourself to the oneness of the universe, you can inspire more love to flow into your experience and your life. Invite love in, and freely share love with all whom you meet, and I speak not only of romantic love, I speak of love in all of its many forms and complexities. For love has no limit and as you nurture the love within you, as you tune into love and let love grow within you, as you serve others and share love with the world around you freely and openly in every moment, you claim the transformative power of love, the power of love to create improvements, the power of love to manifest blessings. The power of love is truly unlimited. Invoke the feeling of love in your life. Tune into love through expressing gratitude and appreciation of all the many blessings of your life, and experience love through expressing gratitude and appreciation of all the blessings and positive attributes of others' lives. As you look for love in reality, and as you create loving blessings in your reality, love builds and grows. The more you love, the more you give love, the more you share your love, the more love grows. Love given away freely does not diminish love, it increases love. The love you send out returns to you multiplied. And so if you are desiring more love in your life, cultivate an inner love beginning with self love, beginning with platonic love, beginning with love and appreciation for earth, for animals, for birds, for trees, for plants, for sky. Loving what is aligns you with more blessings of love which will flow your way. Love builds and compounds with attention and awareness, and so as you become more aware and seek out small things in your life to love and to be grateful for, as you love what is in your reality, you draw more love unto you. As you share love freely with others, you inspire love to bloom and grow. Love has the power to transform the planet on which you live in a positive way, to heal hardship, and duality. By being in a state of love, loving what is and loving the moment, by entering in, by quieting your mind and tuning into the full love of your heart as you breathe, as you drop your awareness within, as you activate your heart chakra by focusing your awareness on it and focusing on love, as you enter into the still and calm within your heart, you tune in to the unlimited amount of love available from the universe in every moment. In every day, love connects all. When you tune into the gaps between what is, to the space between these words, to the silence within your heart, you will be able to feel and know the love of all, the love of the Divine, the love of Creative Source God, for all of creation. When you tune into this love and cultivate it within you, it becomes easier for you to effortlessly share love with others. Cultivate an inner state and attitude of love, a perspective of love, share this love with all whom who meet giving a gift to all whom you meet, whether it is a gift of a kind thought or blessing, a gift of a book, a flower, or a smile… When you give love to all whom you encounter in even a subtle way, you inspire your every encounter to usher you closer to unlimited love. For when you are in love, you are in a place of manifesting blessings of love unto you. Sharing love freely brings more love into your experience, improves your reality, and improves all of reality. Love and fear are two routes, two separate paths. As you choose love, you progress upon the path of awakening, the path of understanding love, the universe, and all that is. Love connects all. And so as you are tuned into love, you are connected to all. And as you are connected to all and tuned into love in every moment, you are able to contribute lasting positive benefit to all. Love heals, love inspires, love transforms… Healing, inspiration, transformation, these are needed in your world now. And so you as an individual have the ability to cultivate love within you in every moment by, yes, turning away from the dense challenges and struggles of your life. When something bad or challenging happens and triggers past emotion, shame, guilt, or frustration, you do have the choice to tune into these, to these energies which are ultimately fear. Or you yourself can become transparent, silent, aware that you are less an individual and more one source energy flowing throughout all. You are connected to all and through this connection to all you are connected to love. And so release your grip on past struggles, or current challenges. Release the grip, release the attachment to what is and tune into the love that is ever present. Even in the most tragic and challenging situations, whether an ounce of love or a pinch of love, love can be found. Focus upon the love, look for the silver lining, look for the hidden blessing, and love. Love the gact that something is falling away from your reality, for this means something new is entering in. Find the small facets of any situation that are worthy of loving and in every situation. You are worthy of love and able to be loving. Tune into the love, let love surround you, let love fill you, let love uplift you, for love is unlimited. Love is powerful and all you need to do to tune into the full power and might and glory of divine love is allow it in. Look for things to love, increase your awareness of where love is present. Notice the love among others, notice the love among animals, notice the love of the sun to the trees and plants and earth. Notice the love of the stars. Notice the love of the natural world around you and notice the love that you are able to tune into within your heart. In the still, silent space between words lies the entrance into the realm of unconditional love. We in the angelic realm are able to see the love in every moment. And so if you are finding that it is challenging for you to love your current lesson, your current challenge or your current situation, ask for help, ask angels and we will enter in to help you to cultivate love within you. Regardless of what is happening around you, by quieting your mind and by entering inward, you can and are able to tune into complete unending and unbeginning always present love. From this perspective, from love, by seeing the silver lining, by seeing the subtle blessings, from the perspective of love, even the largest challenges and struggles are able to be transformed, uplifted, and healed through the power of love. Love knows no limit. You are only limited by the beliefs you impose upon yourself. But when you enter into love, even these are able to be transformed. With an inner attitude of love and gratitude, you are in alignment with the Divine. You are in alignment with love. And when in alignment with love, you are on the fast track, the master path, to growth, to improving your life, to bringing more joy and love and fulfillment into your experience. Follow the path of love by taking one step at a time to usher more enjoyment and love into your life and into the lives of all. This combined with celebrating the love you do see in the world around you causes love to open, to blossom, and to grow. When you notice struggle, density, or tragedy in your world, do not dive into this. Rather, return to love. Look for the silver lining, turn away from the tragedy, and focus upon the love that is present within the gap, that is present beyond the veil, that is present always, always able to be tuned into… the perspective of love. The path of love is the master path to full awakening and opening and connecting with all, with the Divine, and ushering love in to the earth in a tangible way. In every moment, to shift away from density and duality and into the common connector of joy and love. Know that you are infinitely loved. If you are finding you are having challenges loving yourself due to your past actions or struggles or challenges, call in your team of guides and angels. Invite us to release all judgment and to anchor love, compassion, and acceptance. We will help to carry you forward, and will uplift you, empowering you to inspire positive changes of love throughout all of creation. You are connected to all, and so as you inspire more love in your own life and experience, as you encourage the vibration of love to be nurtured and built in someone you are close to, as you make these changes of aligning with love in your immediate reality, a ripple is created. Love is set free to build and grow and spread and return to you and return to all uplifted, purified, grounded into physical form, the love of the Divine. Tuning in is simple. Quiet your mind, open your heart, enter in to love. If doubt comes in, if fear comes in, let it go. Ask your team of guides and angels to take it into the light, and to help you to enter fully into the knowing, the experience, and the blessing of love. Divine love is all around you now. Breathe it in to heal your mind, body, and spirit. And now as you breathe out, share the blessings of love with all. Breathe in love and flow blessings of love out. You have the ability to create a ripple of change throughout consciousness, a ripple of positive change… of love! Every moment is your opportunity. Support is always available. Nurture love, nurture well being, nurture your inner spirit to let love blossom. Love is the master path, not the easy path, but rewarding and fulfilling. Within your heart, within the calm, still, silence of your heart, love can grow. Nurture love and love will nurture you and all. One moment at a time, return to love, to well being, to gratitude, and these forces of the Divine, these forces of love, will carry you forward on your path of awareness, of opening, of living life inspired, life centered in unconditional love. Beloved, you are immensely loved. Receive these blessings of divine love now. Share them, let them grow, let yourself be inspired and awakened fully through the most powerful force in the universe. Through love, all things are possible. You are so loved, you are blessed, and you are lifted. We leave you now with love’s blessing, with divine love. Goodbye for now. ~Archangel Zadkiel channeled by Melanie Beckler. Thank you Melanie,i am Mxolisi Daniel Maseko a male who is a South African, i like to know that you are only assisting people about love, so what about financial issues? Beautiful thank you. I am very grateful for all the channeling you do Melanie. Thank you. With love and light ? I don’t have a mp3 player. I’m old & just starting with computer.